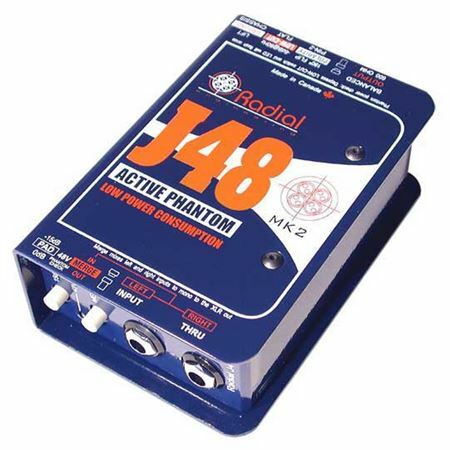 Order your Radial J48 Active Direct Box from AMS and enjoy 0% Interest Payment Plans, Free Shipping, Free Extended Warranty & 45 Day Money Back Guarantee. 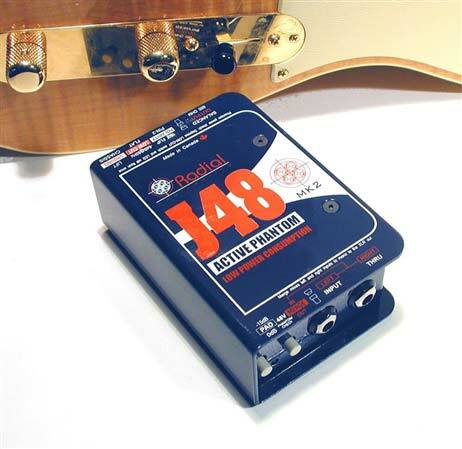 The Radial J48 Direct Box is a great sounding active DI that has been optimized to produce maximum headroom while working within the limited current available from standard 48V phantom power. 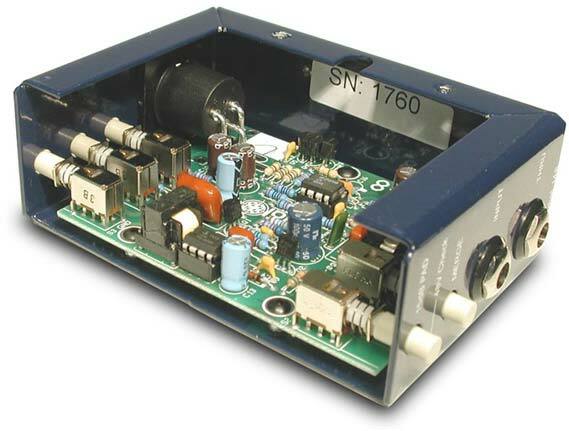 By employing a unique switching power supply, the J48 is capable of peak transients to 9 volts without choking. The result is lower harmonic distortion, half the inter-modulation distortion and significantly improved dynamics over other DIs. Features include a -15dB pad, 180º polarity reverse, a unique merge function to mix two signals to mono, an 80Hz high-pass rumble filter, and ground lift. Like all Radial products, the J48 is built to handle the abuse on the road and features a unique welded I-beam construction for years of trouble free performance. The single most important development goal of the Radial J48 was increasing the headroom without compromising sound quality. To this end, every possible effort was made to deploy the limited energy resources of phantom power to the audio signal path. To begin, phantom power is converted using a super-efficient digital switch-mode power supply that steps up the internal rail voltage to an impressive 10 volts. This allows one to hit the J48 with as much as 9-Volts without choking! To further increase available horsepower, all non-essential devices such a power-hungry LEDs are turned off when the J48 is in use. A typical LED requires almost as much current as does the complete audio circuit! Welded I-beam construction makes it impossible to torque the PC board. This virtually eliminates cold solder joints - the No.1 cause of system failure in the field. An innovative ‘slide-in-place’ XLR trace makes it possible to use I-Beam girder construction. A digital switching power supply steps-up the internal rail voltage to 9-Volts. The J48 will not choke like other DI’s when hit with large transients. A military-grade PC board is employed for maximum wear and tear in abusive environments. Welded steel standoffs ensure the PC board will not shift. A -15dB pad allows super hot inputs such as that from a CD player to be connected and balanced for long runs. Momentary 48V Check LED will flash once when the 80Hz filter is depressed to tell you phantom power is present. The Merge function turns the input & thru into ‘left & right’ inputs to mono mix at the XLR output. This handy function saves valuable inputs on the mixer! The thru-put is connected to the instrument amplifier. The JDI has a high input impedance to reduce loading. Radial's book-end design creates a protective zone around the switches & connectors for best protection! A heavy-duty baked enamel finish for excellent durability and great looks for years! 100% 14-gauge steel construction. The 600 Ohm balanced XLR out is mic level to properly match concert splitters - will drive 1000 feet without appreciable noise. A polarity reverse switch flips the polarity from the AES standard Pin-2 to Pin-3 on the XLR and is used when combining sounds that may be out of phase. An 80Hz low-cut (high-pass) filter gently reduces excessive bass for more headroom and clarity. Eliminates run-away resonant feedback from acoustics! The ground-lift disconnects the ground path to the transformer at the XLR output. This is used when a ground path is made at the input side such as with a keyboard. A no-slip full bottom pad reduces mechanical vibration, improves electrical isolation and keeps the JDI from moving around on busy stages! The Radial J48 is a pleasure to use. It is plug & play easy and is perfectly adept for studio as well as live concert sound. Connect the instrument to the 1/4 inch input, the instrument amplifier to the 1/4 inch output and the mixer to the XLR. Lift the ground if you encounter hum or buzz in the system. The polarity reverse can sometimes help when looking for a sweet spot and is always worth trying. In the studio, when combining a mic’ed signal with a direct feed, reversing the polarity can be huge! Using the 80Hz roll-off filter is generally recommended for acoustic guitars as this will reduce the boxy sound that is often associated. It will also lessen run-away resonant feedback that can creep-up, especially as systems are being run loud. Depressing the filter switch will momentarily provide 48V power status which of course is a good idea before turning up sound system volume levels. Another innovative function on the J48 is the merge switch. This resistive mixer allows a stereo source such as a stereo keyboard to me merged or mixed mono at the XLR output. This handy feature makes life easy for the engineer when confronted with more instruments than available channels. For the keyboard player, reprogramming stereo-panned outputs is not required. Just plug the stereo source in, hit the merge and you are ready to go. The Radial J48 is a great sounding active direct box that is specifically designed to work with today’s powerful active instruments. It is unique in that it provides a real-world solution to the limited headroom caused by inadequate current from 48V phantom powering. The expanded headroom has the direct advantage of increased dynamic range and the bi-product of reduced harmonic, phase and inter-modulation distortions. Plug and play easy to use, the Radial J48 is ideally suited for studio, broadcast and stage use where high quality sound is required. Provide the best sounds quality from my keyboards to the mixer. Love the merge feature for venues that only provide a single line for my dual keyboards (mono output from each board); which means i don't need to bring a sub-mixer to a gig anymore. Built like a tank; I expect this to last for 10+ years with heavy gigging. SmartSheets are downloadable, printable quick information sheets in pdf format designed to clearly highlight the benefits and features of each Radial product.